This is the second lizard to hitchhike onto our boat via a bicycle. 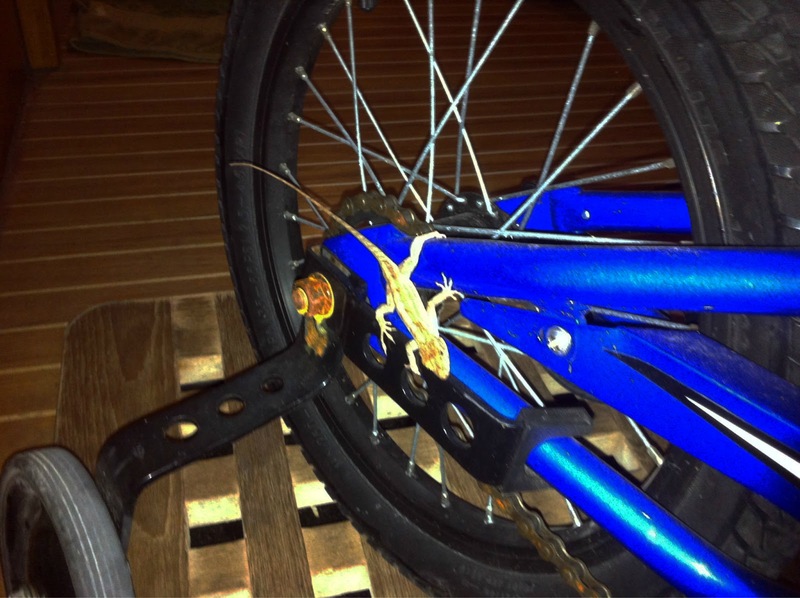 We had the bikes outside for a couple months and apparently some lizards made themselves comfortable on them without our knowledge. When Dad was trying to catch it the kids kept screaming, "Don't grab its tail! The tail will fall off and there will be blood EVERYWHERE!" Lizards sometimes drop their tails to escape predators and then the tail grows back later. The first lizard (that we saw) eventually ran off the boat and leaped into the water. He did not realize that we were docked and that he could have used the docklines to escape. We did not see him again. Poor lizard. This second lizard is running around the outside of our boat now. Unless he made a similar kamikaze move and jumped off.